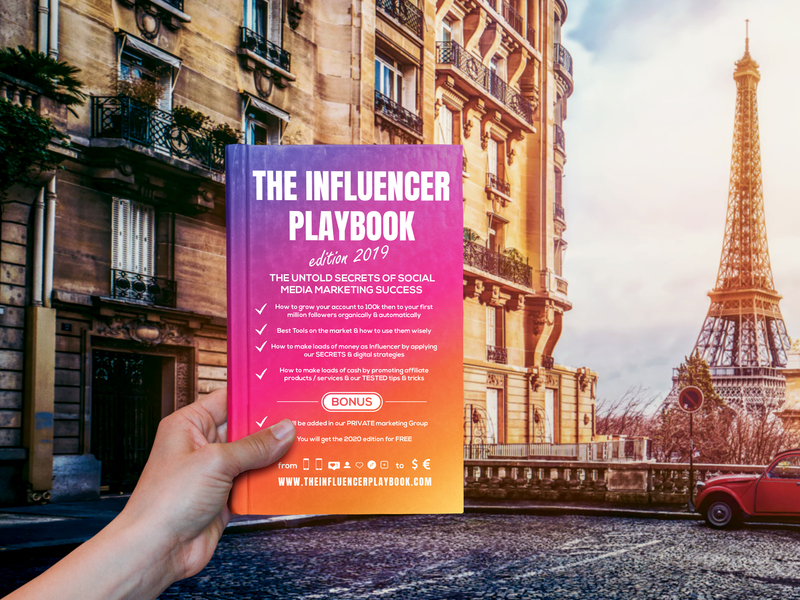 The Influencer Playbook is definetly one of the best playbooks on Influencer Marketing on Instagram and marketing on Instagram released in 2019. This playbook is written from a digital marketing agency owner’s with more than 11 years of experience perspective, using also the advices & feedback of more than 32 influencers and marketing managers worldwide who contributed, and we guarantee you that the info listed in this book is made to help everyone who want to start & develop a good career in social media business or the people who want to grow on Instagram and start to make loads of money. The Influencer Playbook shows you every details that you need in order to succeed on Instagram, from basic info that you need to have a good profile & bio to deep digital marketing advices & to how to make money on Instagram as an Influencer or how to make money in different ways like affiliate marketing using the masses of traffic that can be generated on Instagram (with some great details), dropshipping, how to promote your business on Instagram in 2019 with the best tehniques on the market and other interesting ways to make money on Instagram. Also in The Influencer Playbook you will give you the best tools that can help you to grow absolutely on Instagram faster by using some untold secrets. The Influencer Playbook buyers from 2019 will also get in 2020 the new & updated version for FREE and will be also added in a PRIVATE & SECRET Facebook Digital Marketing group where they can find a lot of informations about digital marketing on Instagram, trends, tools, updates and so on. “A friend of mine recommended me this e-book and, at first, I was pretty sceptical. I’ve seen lots of e-books which claimed to be useful, but they don’t. So I didn’t embrace the idea of spending money on an e-book like this. Even though, I did. And I’m glad that I’ve made this decision. I’ve been through a lot during my journey when it comes to growing my social media accounts. I’ve heard many tips, but I didn’t know what to do precisely to build a professional account on Instagram. It drives me crazy because I used to put a lot of effort in my work but I’ve seen no results, until I started to read The Influencer Playbook. Since the very beginning until the end this ebook teached me how to build my profile, how to give it a better look. One of the best things I learned from this ebook is how to make my feed looks nicer- I had a problem with this thing since like forever, but it was mostly because I didn’t know how to do it.